by Bill Dwight on Thursday, May 24, 2007 at 3:46 PM | LEAVE A COMMENT! Just over a month ago, I shared my Burn Down Chart status and noted that I had not transitioned from burning up to burning down just yet. In fact, I was aggressively headed in the wrong direction. Well, after a month+ of solid heads-down work, I have finally turned the corner. I am now consistently completing more tasks than I am adding which is represented by the red line heading nicely downward. 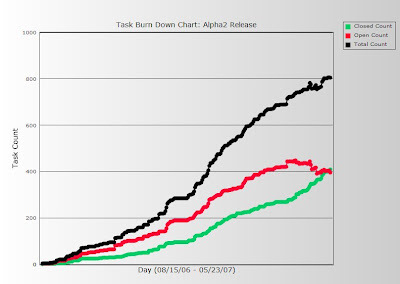 Furthermore, on its way down, the red line for open tasks finally crossed over my green line for completed tasks (meaning that I now have fewer open tasks than completed ones). Ahhh - feels much better. I have also added an additional line - the black one - that denotes the total number of tasks over time so I can clearly see when work is added to (or subtracted from) the deliverable. You can see that I am still adding work as the process of discovery continues but they are being added at a slower rate and the black line is starting to level off as I get a firmer handle on the total scope. Another nice milestone was the recent signing up of a handful of brave FamZoo Charter families. While the capabilities and implementation are still malleable, I want to help ensure that I don't build a "special" - i.e., something that just caters to the idiosyncrasies of my own family instead of being a broadly useful and useable service. I now have 6 FamZoo Charter families outside of my own family and have already received some excellent, helpful feedback.